Assume that all cliff edges are unstable. Wet trails or soft sand and earth can make for unstable footing. Rocks can be slippery even when it isn’t raining so keep to paths and avoid walking close to edges in high winds. 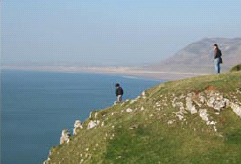 Keep back from cliff edges – a slip or trip could be fatal as some cliffs overhang or are unstable. Children and dogs may not see potential dangers – such as cliff edges – especially if they are excited. 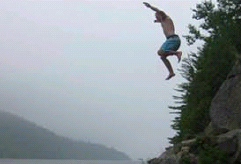 Tombstoning is a high-risk activity involving jumping or diving from a height into open water. 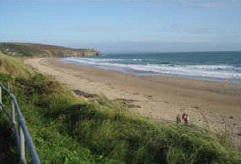 Water depth alters with the tide; the water may be shallower whilst submerged objects like rocks may not be visible that can cause serious injury. The shock of cold water may make it difficult to swim and strong currents can rapidly sweep people away. Don’t let alcohol, drugs or peer pressure affect your judgement. Think before you jump! Walking on coastal footpath can be dangerous, especially if it has an overhang. In some places, winter storms and high waves have eroded the shoreline, increasing the chance of collapse and slides. Play it save and make sure you wear proper footwear, pay attention to warning signs and stay behind fences and railings. Especially when with small children stay away from the edge.